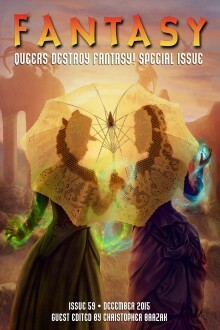 Queers Destroy Fantasy!, our special all-queer issue of Fantasy Magazine, funded as a stretch goal of the Queers Destroy Science Fiction! campaign, is now available in ebook and trade paperback. Christopher Barzak is the author of the Crawford Fantasy Award winning novel, One for Sorrow, which has been made into the recently released Sundance feature film “Jamie Marks is Dead”. His second novel, The Love We Share Without Knowing, was a finalist for the Nebula and Tiptree Awards. He is also the author of two collections: Birds and Birthdays, a collection of surrealist fantasy stories, and Before and Afterlives, a collection of supernatural fantasies, which won the 2013 Shirley Jackson Award for Best Collection. He grew up in rural Ohio, has lived in a southern California beach town, the capital of Michigan, and has taught English outside of Tokyo, Japan, where he lived for two years. His new novel, Wonders of the Invisible World, was recently published by Knopf. Currently he teaches fiction writing in the Northeast Ohio MFA program at Youngstown State University. Matthew Cheney is the former series editor for the Best American Fantasy anthologies, and he currently co-edits the occasional online magazine The Revelator with Eric Schaller (http://revelatormagazine.com/). His fiction and nonfiction have appeared in a wide variety of venues, including Nightmare, One Story, Weird Tales, Black Static, Icarus, Los Angeles Review of Books, Locus, Strange Horizons, and elsewhere. His collection Blood: Stories will be published by Black Lawrence Press in January 2016. Richard Scott Larson holds an MFA from New York University, which he earned at the Writers Workshop in Paris. His fiction has appeared or is forthcoming in failbetter, Joyland, Strange Horizons, Booth, Subterranean, Shimmer, Eclectica,Pindeldyboz, Daily Science Fiction, and other venues. His short stories have also been reprinted in Beyond Binary and Wilde Stories: The Year’s Best Gay Speculative Fiction. He contributes genre film reviews and book criticism to Slant Magazine andStrange Horizons, and he often serves as a judge for short fiction competitions at NYC Midnight. Born and raised in St. Louis, he now lives in Brooklyn and works for the Expository Writing Program at NYU. Robert Levy is an author of unsettling stories, screenplays and plays whose work has been seen Off-Broadway. A Harvard graduate subsequently trained as a forensic psychologist, his first novel, the contemporary dark fairy tale The Glittering World, was published worldwide in February by Gallery/Simon & Schuster. Shorter work has appeared in Icarus: The Magazine of Gay Speculative Fiction, Shadows & Tall Trees, and the Harper Perennial anthology The Moment, among others. Robert can be found in his native realm of Brooklyn, as well as online at TheRobertLevy.com. Erica L. Satifka’s fiction has appeared in Shimmer, Daily Science Fiction, and Clarkesworld. When not writing, she works as a freelance editor and teaches classes on SF/F writing at Portland Community College. She identifies as a bisexual woman and lives in beautiful Portland, Oregon with her genderqueer spouse Rob and three needy cats. Follow her on Twitter @ericasatifka or visit her website at www.ericasatifka.com. Tracie Welser’s work has appeared in Interzone, Crossed Genres, Outlaw Bodies and Lightspeed Magazine’s Women Destroy Science Fiction. She is a graduate of the Clarion West Writers Workshop and is currently working on her first novel, an post-apocalyptic roadtrip through a landscape populated by motorcycle stuntwomen and talking animals. Henry Lien is an art dealer and proprietor of The Glass Garage Gallery in Los Angeles. He represents artists from North America, South America, Europe, and Asia. His artists have appeared inARTnews, Art in America, Juxtapoz, The Huffington Post, and Time Magazine, and been collected by and exhibited in institutions and museums around the world. Henry has also served as the President of the West Hollywood Fine Art Dealers’ Association and a Board Member of the West Hollywood Avenues of Art and Design. Henry also has extensive experience as an attorney and teaches at UCLA Extension. In addition, Henry is a speculative fiction writer. He is a Clarion West 2012 graduate, has sold his work to Asimov’s, Analog, Fantasy & Science Fiction, Lady Churchill’s Rosebud Wristlet, and Interfictions, and has been nominated for a Nebula. He is originally from Taiwan. Visit his author website at henrylien.com.